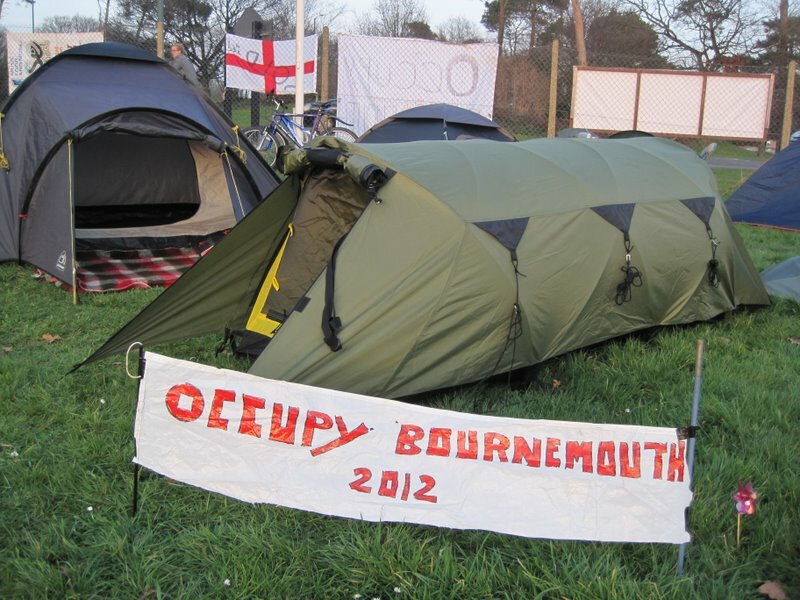 OCCUPY protesters yesterday ended their 18-day long protest at Bournemouth University. 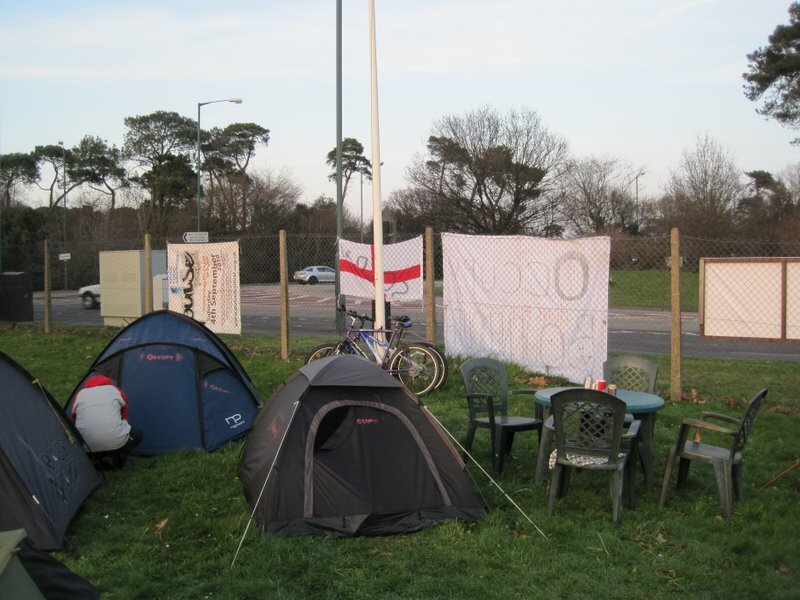 The group moved from their temporary home at the Talbot Campus entrance near the Boundary Roundabout shortly before bailiffs arrived at 2pm. 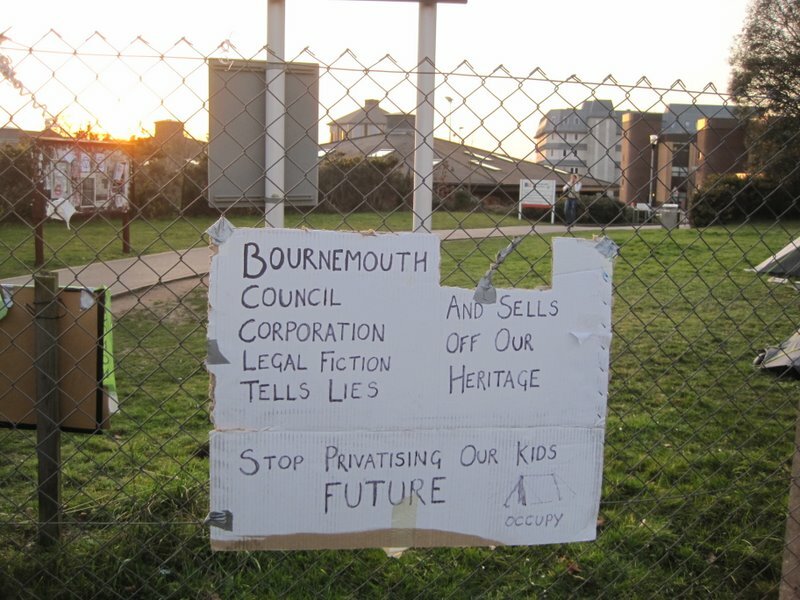 It followed a hearing at Poole County Court where a district judge granted Bournemouth University a full injunction to exclude the protesters from university land. 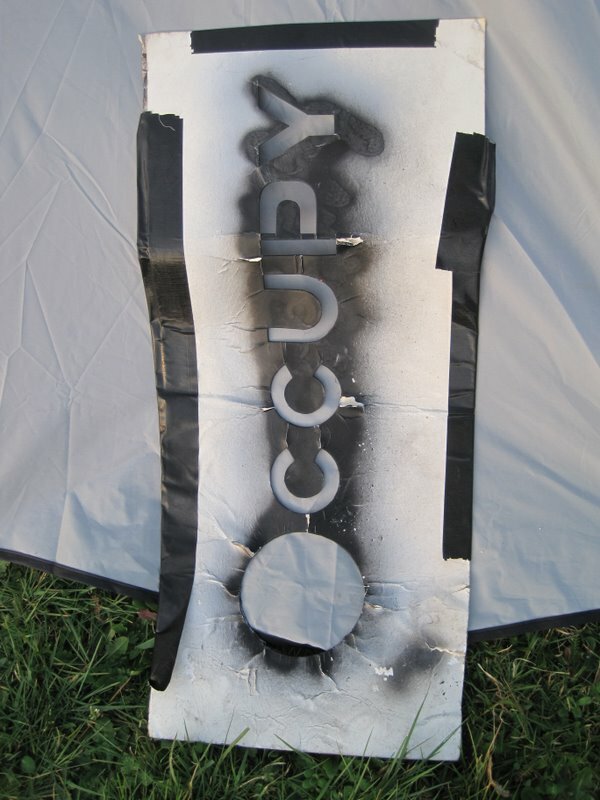 The judge also issued court costs against the protesters. 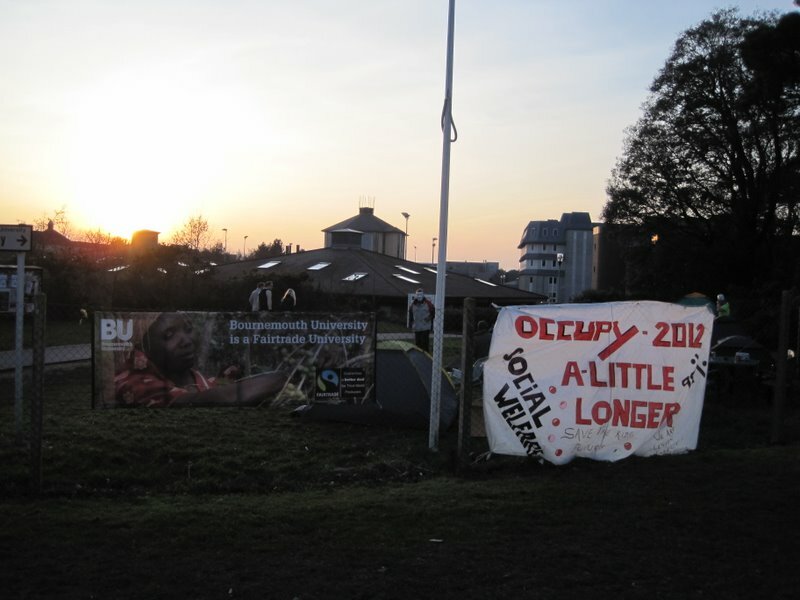 As far as I understand, there were two different legal proceedings, one brought by the owner of the land, Talbot Village Trust (which concerned the actual eviction), and the other concerned the above-mentioned injunction by Bournemouth University, to prevent the protesters from relocating to other parts of the campus. Talbot Village Trust is a charity that was established in the 19th century by aristocrats to provide social housing for the poor in the area, so it is somewhat ironic that this time they were involved in chasing a protest movement off their land that also concerns itself with social and economic inequality. The exhibition will be open from March 30 to June 10, 2012. Tammy Lu gratefully acknowledges the support of the Saskatchewan Arts Board. In case you didn’t know, the Intro and contents of the French version of Latour’s Inquiry into the modes of existence is currently available on his website. I was already familiar with most of the arguments and material presented in the introduction as this is mostly stuff I have already heard in some of his recent talks and interviews. Some themes are presented in this talk from a 2006 seminar in which he discusses Irreductions 30 years later and puts it in perspective with his new work. 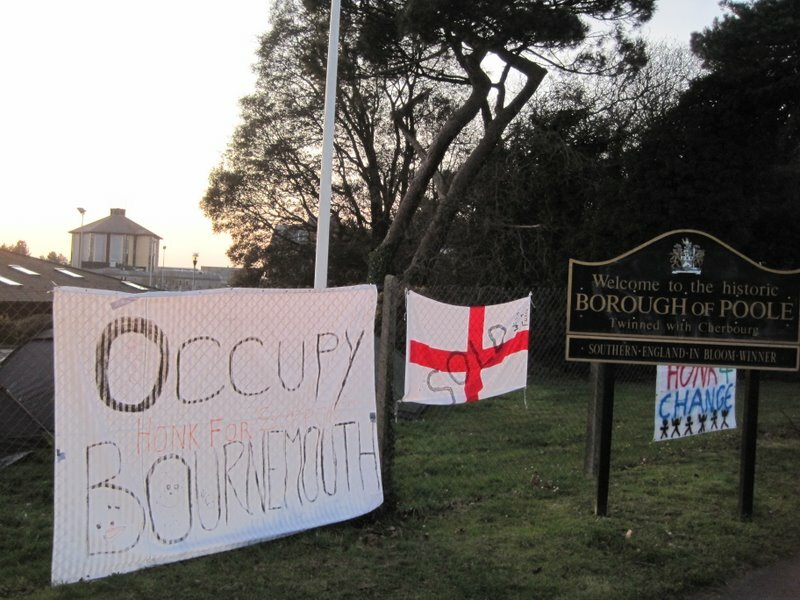 One thing I would have definitely not predicted about the likely evolution of the Occupy movement is that its next flashpoint would be my own town, the quiet seaside holiday resort of Bournemouth. 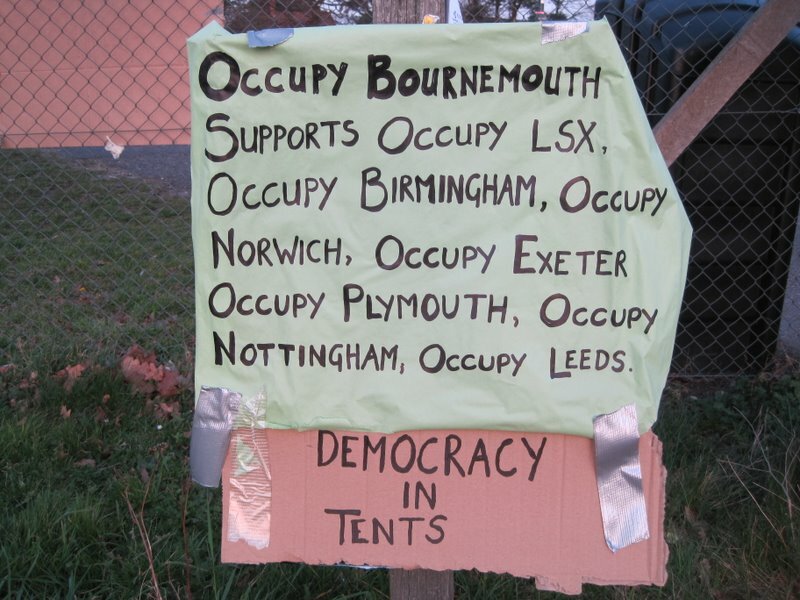 But apparently after the protesters were evicted from the St Paul’s camp in London a few weeks ago, they somehow figured out that the Chancellor (a largely ceremonial role) of Bournemouth University is Lord Nicholas Phillips, who also happens to be the President of the UK’s Supreme Court. 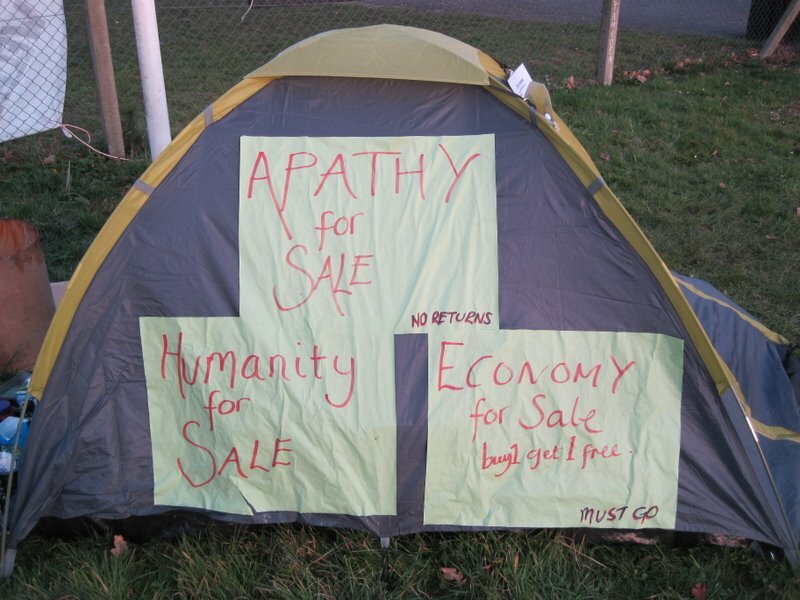 So last Friday they set up camp on the lawn at the rear entrance of Bournemouth University’s Talbot Campus, with one of their demands being a meeting with Lord Phillips. 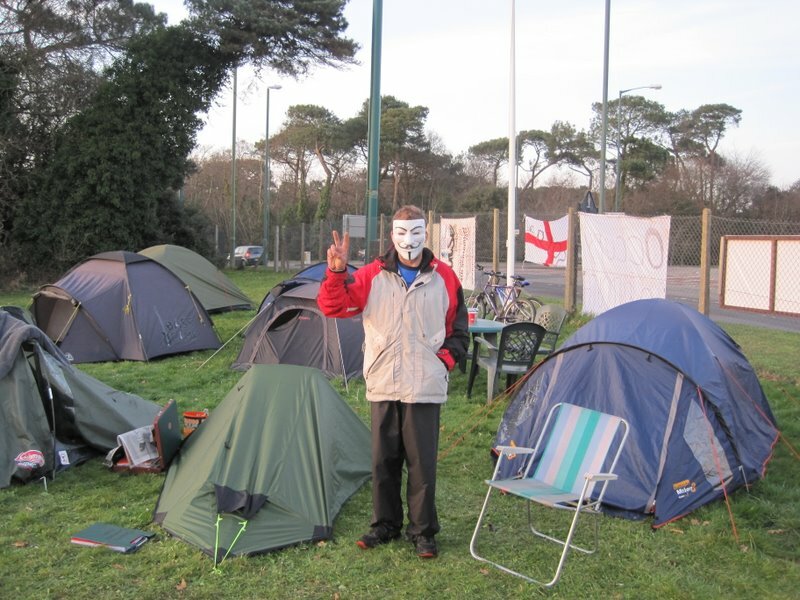 This is happening literally on my doorstep, so on Sunday evening I grabbed my camera, got on my bike and paid a visit to the Occupy Bournemouth movement. 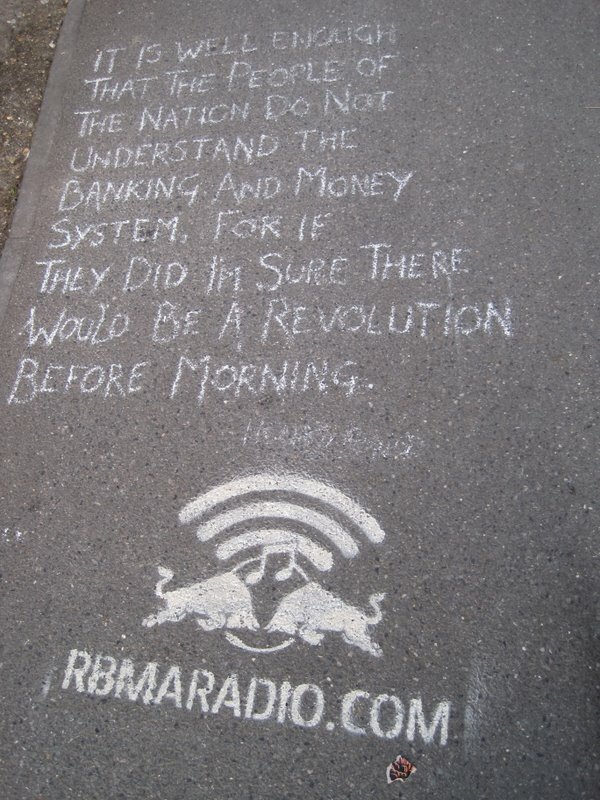 There were two middle-aged guys busying themselves at the site, writing messages on the pavement with chalk, putting up posters, and setting up a tent, which one of them told me was going to be the “library,” where people will be able to educate themselves about the movement and other political matters. 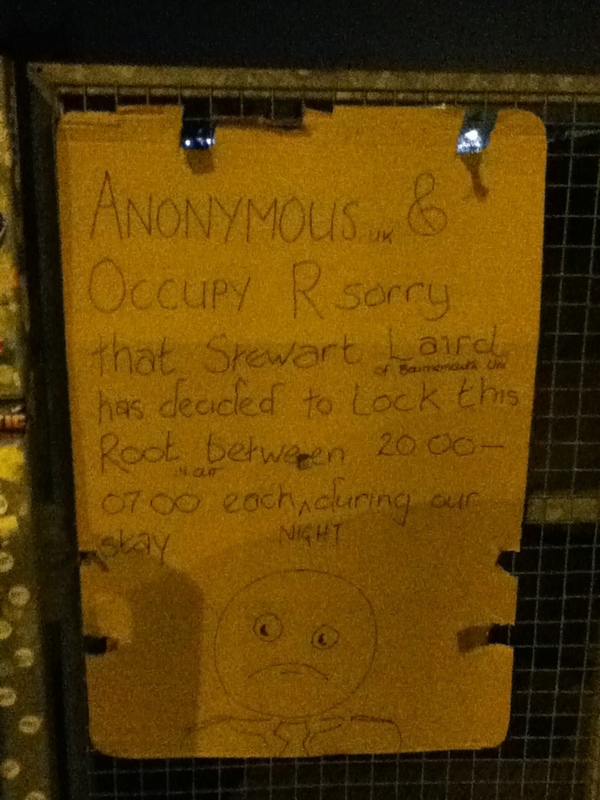 Both men had their Guy Fawkes masks resting on the top of their heads, ready to deploy at a moment’s notice. 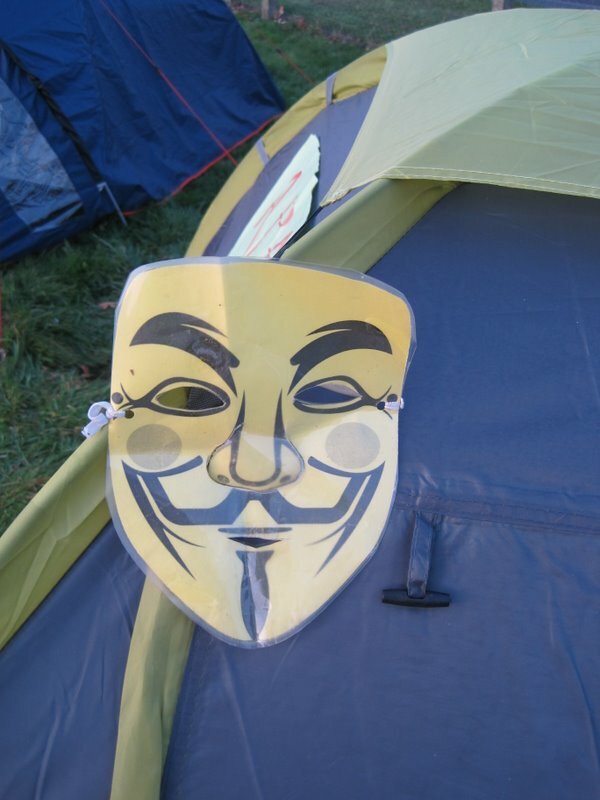 They were happy to put it on for me, and indeed whenever someone showed up with a camera, the masks came down. When I took a break from photographing and was chatting with one of the protesters, I saw from the corner of my eye that another protester also took a photo of me chatting to his comrade. I wouldn’t be surprised if I’ve turned up in one of their social media streams already. 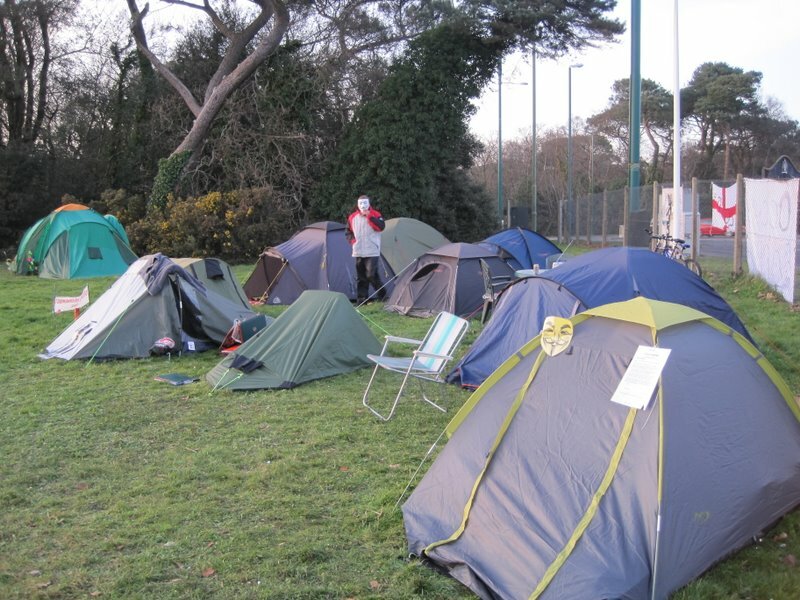 The camp is situated right next to a busy roundabout (Boundary Roundabout), on the border that separates the towns of Bournemouth and Poole, and is very visible to passing traffic. 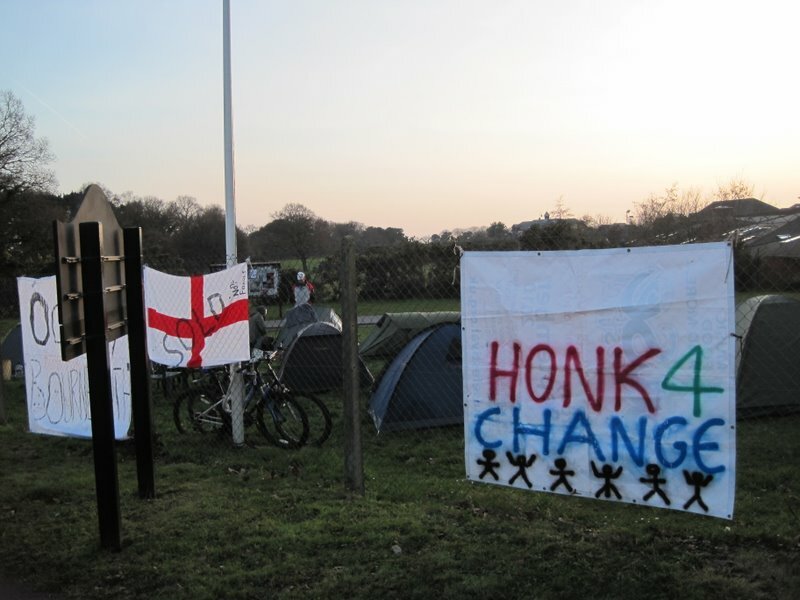 Drivers periodically honked in support, as they glimpsed the camp’s banners asking them to do so. 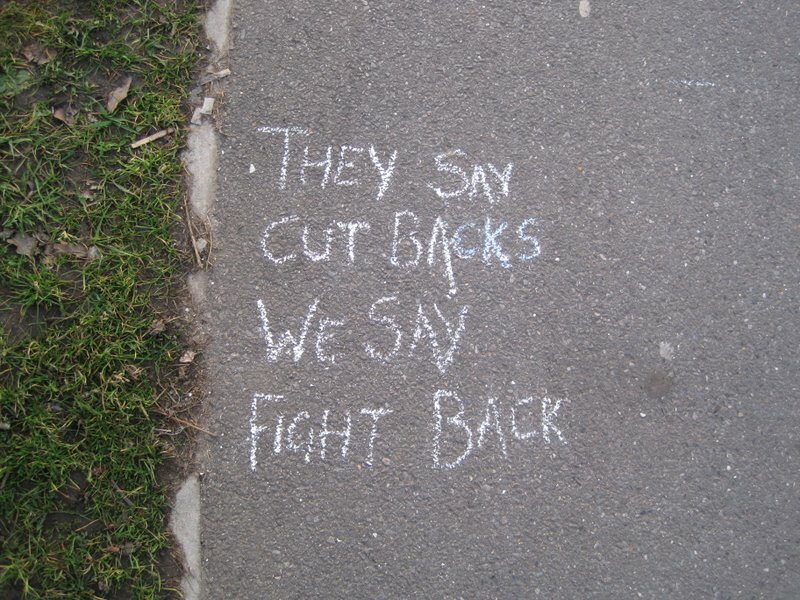 It is also right next to the footpath at the rear entrance of the campus, where thousands of students and staff pass by every morning and afternoon. It will be interesting to see the next move of the University and/or the Council. But my interlocutor gave me the impression that they were in for the long haul and the camp was only just in the initial stages of being constructed. 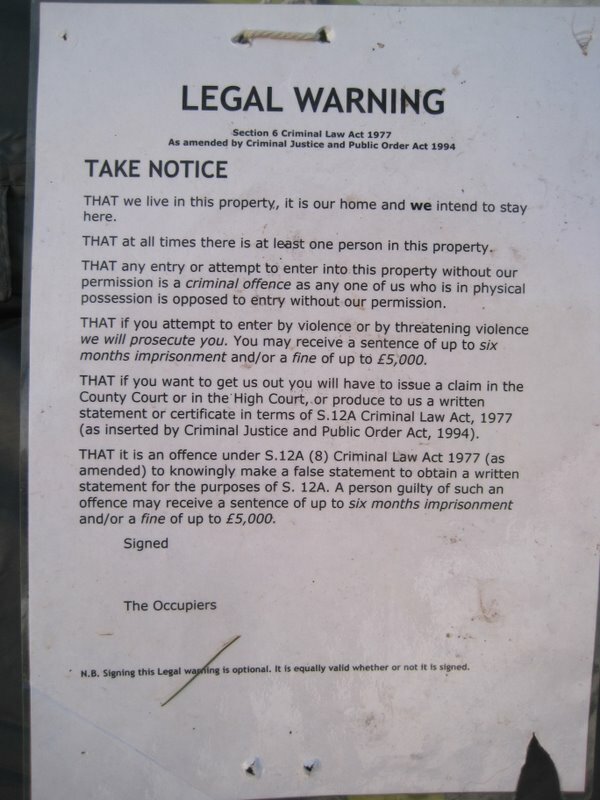 Plus photo of the sign on the rear gate. 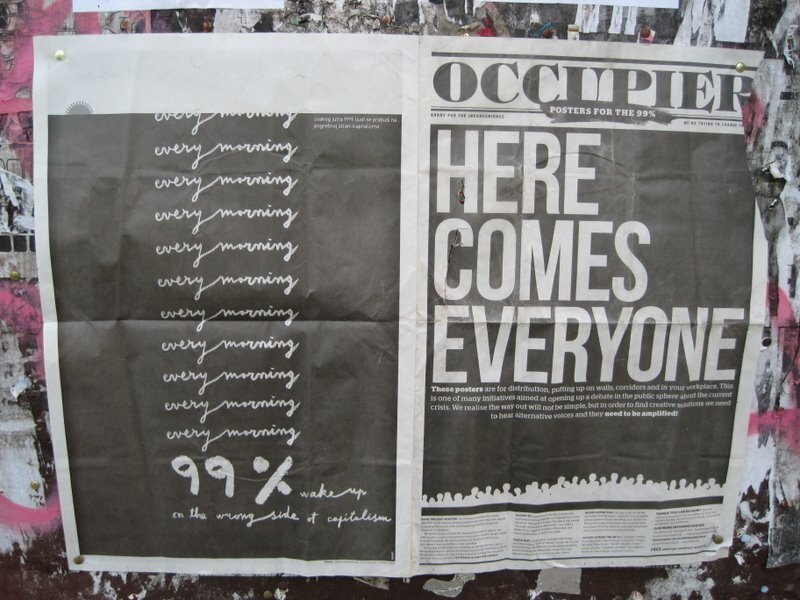 On “Cosmopolitics: Learning to Think with Sciences, Peoples and Natures,” Halifax, Canada, March 5 , 2012. 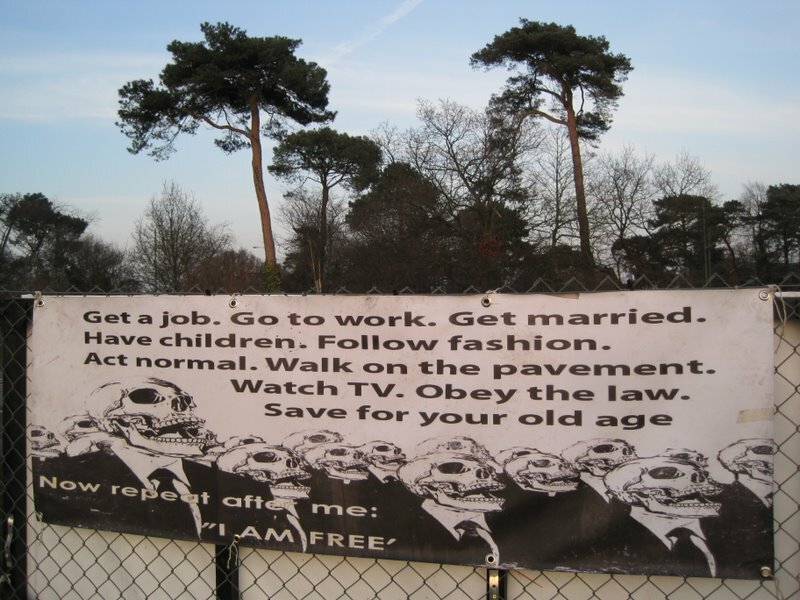 Thanks to dmf for the link. More details here. Call for Papers: BRITISH JOURNAL OF MANAGEMENT Special Issue on Strategizing Material & Materializing Strategy. 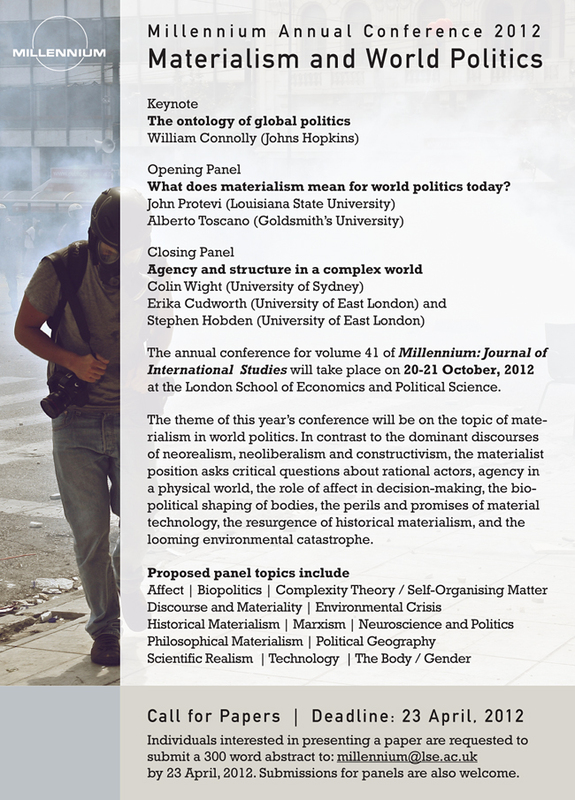 The deadline for submission of papers is 30 January 2013. See the full call here [PDF]. The British Journal of Management is pleased to announce a special issue focused on strategizing material and materializing strategy. Grounded in practice-based views of strategy, this special issue will explore material practices associated with strategizing: How are objects, artifacts, tools and other material resources used by practitioners to shape and enact organizational strategy? Through research on the practice of strategy, scholars have already begun to explore material objects and strategy tools. One emerging stream of research explores how material objects, including the participants’ physical bodies, are used in strategizing. (…) A second stream of research has investigated the role of strategy tools in materializing strategy. (…) However, much more work is needed to advance this agenda, which is the purpose of this special issue. We welcome empirical papers that provide new insight on strategizing material and materializing strategy. 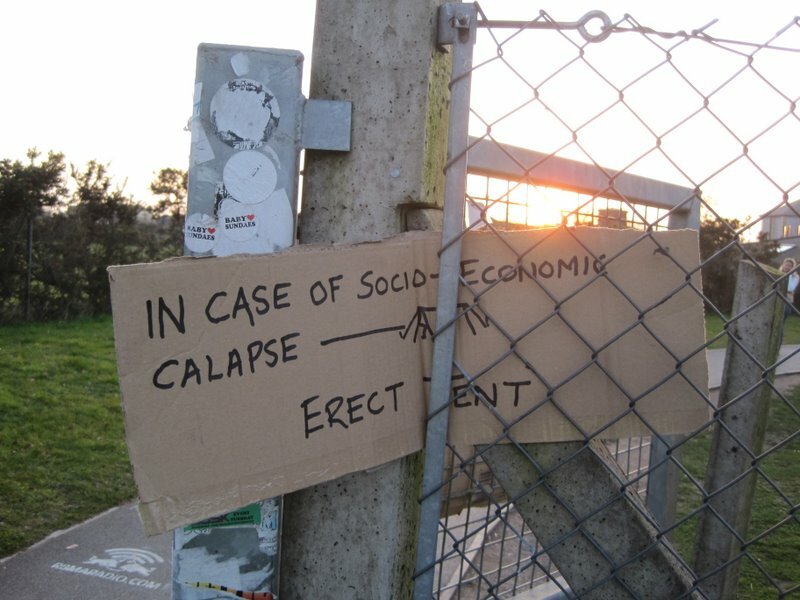 While organization scholars have traditionally privileged discourse (talk and text) as the empirical basis for their research findings, a growing number are turning their attention toward socio-materiality, which refers to the “inherent inseparability” of social and material aspects of organizational work (Orlikowski, 2008, p. 434). Sometimes material objects are treated as actors (e.g. Callon, 1986; Latour, 1987) or material objects and actors as entangled bundles (e.g. Leonardi, 2011). We invite diverse research methods, both qualitative and quantitative. We are open to innovative approaches, including action research, cognitive mapping, conversation analysis, video ethnography, simulation, and mixed-methods. • How do managers use materials and tools to shape strategic processes and decisions? • What roles do different types of strategists play in creating, diffusing and/or using strategic materials and tools? • How does materiality constrain and/or enhance strategy practice? • How are participants’ physical bodies a resource and constraint for strategizing? • How do materials and tools gain legitimacy? How are they diffused within and beyond organizations? • What types of materials and tools are used to shape the strategy process? How do they shape the strategy process? • What are the dynamics between strategy materials and strategy tools? • What are the dynamics between strategizing materials or tools and other elements of strategy practice (e.g. affect and emotion)? 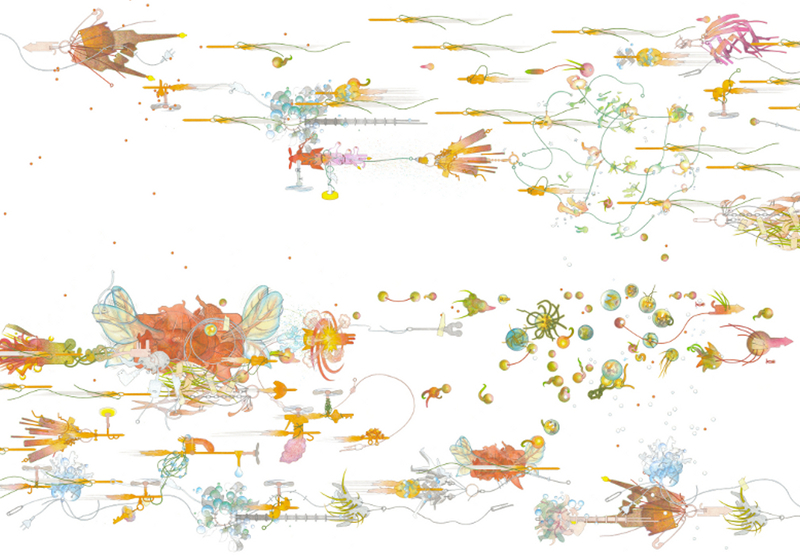 You are currently browsing the ANTHEM blog archives for March, 2012.